Space for even some minimal semblance of democracy in Papua has been absolutely closed whilst the State of Indonesia continues to commit one after another atrocity against the indigenous people of Papua. Alpius Mote for instance, aged 17 years, was shot dead by the Indonesian Special Police Unit BRIMOB on 23 September in Waghete, District of Tigi, when a number of locals voiced objection to arbitrary arrests and most insulting ‘over-the’top’ sweeping by armed forces targeting males with long beards and hair. Then there’s the brutal military operations that have been continuing relentlessly for months in Puncak Jaya and also in Paniai to chase those suspected of being part of the TPN/OPM. Operations which have only led to the innocent civilians becoming victims (such as 12 year old Arlince Tabuni who was shot dead on 1 July 2013 in the village of Popumo, Lani Jaya). There has also of late been an escalation in Papua in the level of intimidation and terrorising acts towards the indigenous people of the land and even more so against Papuan activists (6). In just these last days the bodies of yet 7 more civilians have been found – including a 4 year old and 11 year old child – after their vehicle left Sarmi to head towards the city of Sentani near Jayapura but they never arrived (4). All 7 bodies were found in their upturned vehicle and it is believed they had been abducted. It was reported that they were killed by what has become a common term now in Papua, ‘unknown assailant/s’(5). In order to hide the many forms of tyrannic oppression in Papua, RI has until this time denied access to both international journalists and international human rights (HAM) workers to visit Papua. Indeed ever since Papua was annexed into the Republic of Indonesia (RI) on 1 May 1963, it has been isolated and closed to these international groups. Indigenous Papuans have been forced to live in this state of being terrorised and yet isolated from the reach of the outside world, experiencing violence and a state of upheaval in their lives. Such that for Papuans it’s like existing in the ‘living hell’ of Indonesia. The Australian Prime Minister has never experienced the forms of brutal and tyrannic oppression that indigenous Papuans are forced to live under; neither has he seen first-hand the real -life conditions that indigenous Papuans have been suffering for over 50 years now under the Indonesian Republic. If one has never experienced such oppression and has never seen first-hand the real life conditions of indigenous Papuans but there have been constant reports of brutality and severe oppression for 50 years, then would it not be right that Australia as the current Chair of the United Nations (UN) Security Council should together with other members of the UN Security Council organise for a UN Special Representative to carry out investigation into the alleged human rights violations and the political status of West Papua? Such as was requested formally by the Prime Minister of Vanuatu in his historical speech at the recent 68th session of the annual debate of the U.N General Assembly in New York on 28 September 2013. The people of Papua can only think that Tony Abbott’s words “The situation in West- Papua is getting better, not worse” must be the result of influence from propaganda and provocation by the Indonesian Government recently when he firstly visited Jakarta on 30 September and then when he returned again to Bali to attend the APEC Conference in early October. Indeed of late the State of Indonesia has lifted its level of diplomacy with the use of propaganda and provocation towards the international community and in particular key leaders around the world – of which the Australian Prime Minister is one – in their efforts of working to undermine any possibility of sympathy arising towards the problems of Papua. To achieve that end Indonesia has employed no small level of resources and staff. From the perspective of Papuans the new Australian Prime Minister is not all that different from those in the position before him regarding the issue of Papua. Of course Papuans totally appreciate the importance of the position and interests between the governments of Australia and Indonesia. Furthermore, Papuans truly understand the Australian Prime Minister’s attitude towards Papua must be one of caution in order to protect bilateral relations between Australia and Indonesia. However Australia as a member of the U.N and what more in the trusted position as the current chair of the UN Security Council, has both a legal and moral obligation to uphold and respect human rights around the world and particularly in those particular regions which there is known to be serious concerns such as Papua. Australia cannot avoid its responsibilities to protect and respect the dignity of humanity where freedoms and the very right to life is being threatened such as is the present threat to the indigenous peoples of Papua who are now known to be heading towards annihilation of their race due to a slow moving genocide. The Australian Government has been in the frontline recently in regards to the matter of Papua. On 24 September 2013 seven indigenous Papuans who landed as refugees at Boigi Island in the Torres Strait (including one woman who was pregnant and a 10 year old child) were transferred to Horn Island. After being interviewed by authorities they were given no choice of staying in Australia and were forced to choose between being sent back to Indonesia or going to PNG. They very swiftly transferred to PNG (7). Then on 6 October 2013 three young Papuan males scaled the wall of the Australian Consulate in Bali and entered the compound so as to seek Australia’s help for Papua. They then also sought refuge for themselves. Despite the risk they then faced from Indonesia, in the early hours of that same morning before 0700 hours the 3 had been immediately asked to leave the compound with the threat that the police would be called. In being forced to leave the compound after pleading for help for Papua, of course they were terrified about their safety as their lives were then much more at risk, as they well knew the ramifications could mean torture or leading to them ‘disappearing’ as a result of actions by the Indonesian armed forces. The Australian Senator Richard Di Natale immediately called on the Australian Government to request they be given protection but without response (8). The nation of Papua finds the actions of the Australian Consulate in Bali absolutely unacceptable as the 3 young people had in fact entered the Consulate to seek safety and protection (9). The Australian Prime Minister subsequently stated that the Australian Government is going to suppress any activism in Australia that opposes Indonesia in support of West Papua. Abbott’s statement was immediately criticised by Vanuatu’s first and former Prime Minister Ati George Sokomanu who demanded Tony Abbott explained his statement to the leaders of the Pacific (10). Sokomanu stressed that whilst immigration issues could be dealt with by the courts, that Australia must be prepared to discuss questions of human rights. He stated that due to the fact that Australia and New Zealand are the closest neighbours, “ I think for the sake of the people of West Papua with their rights, that Australia and New Zealand should broaden their view to provide support and do whatever they can to help the people of Papua to achieve their independence”(11). The Australian and international communities that are concerned about the suffering of indigenous Papuans, are following the political direction of the new Australian cabinet under PM Tony Abbott. We are yet to see whether as Papua’s closest neighbour, the Australian government will follow a foreign policy that shows some special care in handling cases of human rights violations in Papua and the political status of the land of Papua? Or whether the Australian Government will merely guard its bilateral relations with Indonesia and allow the Republic of Indonesia to continue to act in such ways that it creates marginalisation, discrimination, making a people a minority in their own lands and carries acts of humanitarian evils through its armed forces against the indigenous people of Papua? 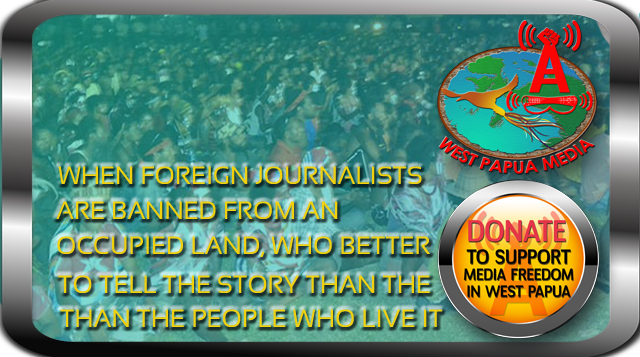 Actions that together are leading to the annihilation of the ethnic West Papuan race. 4. Details of the victims are as follows Bartolomeus Fere (aged 53 years), Agustina Fere (38), Yan Marthen Fere (30), Boas Hawase (35), Elisabet Felle (40), Melinda Felle (11), dan Avia Hawase (4). (Indonesian version) (www.merdeka.com/peristiwa/7-warga-sentani-papua-diculik-orang-tak- dikenal.html). 5. Cenderawasih Post, Edition Monday, 14 October 2013. 6. Such as for example that experienced by the 4 activists in Fak-Fak on 29 September 2013 Abner Hegemur, Yanto Hindom, Morten Kabes, dan Kaleb Hegemur. The activists were riding home on motor bikes on the main road leading to the town of Fak-Fak after visiting some children alleged to have experienced violence by the armed forces at the Tetar village in the Patipi District outside of Fak-Fak. They were followed throughout their journey home by the Special Forces Unit Densus 88 (the anti-terrorist forces now operating throughout Papua against civilians) accompanied by another 4 armed forces vehicles. A number of the vehicles then located themselves in front of the activist’s motorbikes whilst the remainder followed from behind. Those in front kept changing positions with those behind adding to the terrorizing effect on the 4 riders. This continued throughout their journey until they reached the borders of town of Fak-Fak at which time the vehicles drove off.